I'm grateful for my fast (1.4) 50 mm fixed lens!!! I was walking home last night after the show and after a delicious meal (filet de bar, scallops, and risotto - along with a lot of laughs), and happened upon a sight you never really see in Paris, except in the wee hours: empty streets. 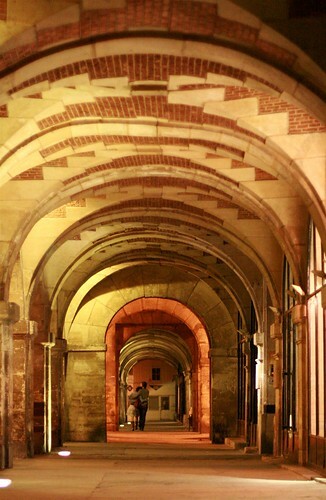 You especially never see that at the Places des Voges, and what has always been one of my favorite spots in this beautiful city stole my heart, yet again, with it's empty corridors of archways and warm, golden light. The fact that a pair of lovers literally "just happened" into my shot was the "pièce de resistance!" I wish I could travel with a tri-pod for these very shots, but that's one more thing to pack - however, my fast lens went far in helping me preserve this beautiful memory with relatively little damage! Thank you for sharing this beautiful, romantic and truly artistic shot! ...scallops and risotto... An unbeatable match made in heaven!